These are Treace’s own words — she’s not quoting the Buddha. The trouble with “Buddha quotes” pages is that most of what they post is not stuff the Buddha said. That’s why I started fakebuddhaquotes.com. Someone’s copied the article and posted it here. 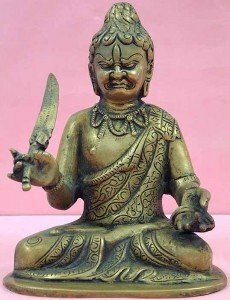 There are lots of Fake Buddha Quotes that sound like something the Buddha might have said, and there are some that are just way out there. This is one of the latter. And yikes, but it’s common! He who checks rising anger as a charioteer checks a rolling chariot, him I call a true charioteer. Others only hold the reins. Let a man guard himself against irritability in bodily action; let him be controlled in deed. Abandoning bodily misconduct, let him practice good conduct in deed. The later Buddhist tradition, having assimilated aspects of Tantra, began to see anger more as a form of energy that could be transformed into compassion, rather than as something inimical to it. I’m not aware of this perspective having found its way into the Zen tradition, but it’s something like this that Treace has in mind in her article. I stress that I’m not saying that anger cannot be channeled in this way, just that this isn’t what the Buddha taught.